In last month’s issue, we began an investigation of Deuteronomy, the final book in the Law of Moses. In this article, we will continue in the first chapter of that incredible book. Deuteronomy is a record of the words that Moses spoke to the people of Israel just prior to their entering the Promised Land. In fact, the first line of the books states, “These are the words,” giving Deuteronomy is Hebrew title Devarim — “Words.” The original adults who fled Egypt have all passed away, and a new generation has risen up. God is going to give them great victory against their enemies in Canaan, but many temptations are also going to face them. Moses gives the Israelites one last sermon to reiterate God’s instructions for them. Here we will pick up with verse five, in which Moses begins to speak to the people. On this side Jordan, in the land of Moab, began Moses to declare this law, saying, The LORD our God spake unto us in Horeb, saying, Ye have dwelt long enough in this mount: Turn you, and take your journey, and go to the mount of the Amorites, and unto all the places nigh thereunto, in the plain, in the hills, and in the vale, and in the south, and by the sea side, to the land of the Canaanites, and unto Lebanon, unto the great river, the river Euphrates. As we squabble about the borders of Israel today, it’s worth remembering that in Joshua 1:4, the LORD promised Israel their land would extend to the Euphrates. David did succeed in conquest to the Euphrates (2 Sam 8:3), but the Israelites did not actually inhabit all those lands. David controlled the Israelite territories, which paid tribute. In a sense, their boundaries reached to the Euphrates and in a sense they didn’t. The prophecies that deal with Israel’s full ownership of all land to the Euphrates will be fulfilled in the Millennium. When people want to talk about the West Bank ask them, “Which river did you have in mind?” Jordan is not the boundary that God originally marked out for Israel. This command should not have shocked the hearers. God had been promising the same land for centuries. God had covenanted to give it to Abraham in Genesis 15 and 17. We really need to understand that. God promised the land to Abraham and repeated that commitment to Isaac and Jacob in Genesis 26:3 and 28:13–15. These three patriarchs, Abraham, Isaac and Jacob, are mentioned seven times in the book of Deuteronomy. Moses is leaving the Israelites no doubt about the nature of God’s promise. It was gracious, and most of all, it was permanent. God is the God outside of time. He doesn’t experience the passing of years like we do, and a few centuries or millennia can’t dim His perspective. He does not forget His purposes, and He will see them accomplished. We find this covenant with the patriarchs underscored throughout the historical and prophetic books, throughout the psalms, and throughout the New Testament. I’ve been shocked to learn that most churches have no grasp of Israel’s continued importance. Many denominational churches espouse a brand of theological presumptions called “replacement theology” with the view that the Church has replaced Israel. This contradicts a multitude of Old Testament prophecies, and it rejects Paul’s explanation of the situation in Romans 9–11. If God has dumped Israel in favor of the Church, then He can’t be trusted. There are promises He made to Israel throughout the entire Bible, and replacement theology denies those promises. The denominational churches may not intend to do so, but they are attacking the character of God when they suggest God has kicked aside the physical descendants of Abraham or the land of promise. Even when the Israelites have committed every evil under the sun, and God declares He will punish them, the prophets repeatedly finish their prophecies with promises of restoration and healing. Even when the people of Israel are nothing more than dead bones, God shows them in Ezekiel 37 that He will bring them back to life and breathe His Spirit into them. From the time of the patriarchs, and especially from the time of Moses, every Israelite was supposed to realize that he and his descendants stood in a position of blessing. God’s inviolable promise to take possession will occur 18 times in the book of Deuteronomy. Moses gives the Israelites serious warnings as well, but their fundamental position is one of inheritance. That blessing is continually promised in the psalms and prophets. God’s promises to Abraham were unilateral, and He will not renege. If any nation ever had doubt about God’s intentions or His ability to fulfill His ancient covenant with Abraham, Israel had only to look at her present condition. The people of the nation had become so numerous that they were like the stars. They had grown from a family in Egypt to a virtually innumerable host, according to God’s word in Genesis 15:5. The nation’s growth alone proves that God’s intentions and ability to fulfill those promises are operative here. There are certain phrases we find that Moses repeats in this sermon. “The God of your fathers” in verse 11 is a common title of the Lord in Deuteronomy, and “the LORD your God” occurs more than 250 times in the book. Moses’ purpose here is to separate the Living God from some abstract pagan concept. The oldest of these Israelites were teenagers when they came out of out of Egypt, but their parents had fled a pagan, idol worshiping culture. They were not ignorant savages, mind you. The Egyptians were civilized with brilliant architectural skills and highly developed social and political structures. They had art and music and laws, historians and priests. However, they served pagan gods. The Living God is distinguishing Himself from these abstract Egyptian gods, and He is a God who likes to make and keep His promises. This also makes the Hebrew God distinct from Allah, by the way. Allah is presented in the Koran as the unknowable one. He’s capricious, and he can do anything. That means he’s not trustworthy. The God of the Old Testament delights in making and keeping His promises, which is a different concept altogether. The “LORD God of your fathers” is a very key thought all the way through the book of Deuteronomy. In fact, God’s fulfillment of His promise to Abraham has produced so great a number of Israelites that they have been a burden to Moses — one too great for him to handle. Take you wise men, and understanding, and known among your tribes, and I will make them rulers over you. And ye answered me, and said, The thing which thou hast spoken is good for us to do. Understand what he’s doing, Moses is recapping the concepts that had been laid out in the Torah. Many of the things that Moses iterates in Deuteronomy are a review of things that happened in Exodus and Numbers. So I took the chief of your tribes, wise men, and known, and made them heads over you, captains over thousands, and captains over hundreds, and captains over fifties, and captains over tens, and officers among your tribes. And I charged your judges at that time, saying, Hear the causes between your brethren, and judge righteously between every man and his brother, and the stranger that is with him. Ye shall not respect persons in judgment; but ye shall hear the small as well as the great; ye shall not be afraid of the face of man; for the judgment is God’s: and the cause that is too hard for you, bring it unto me, and I will hear it. And I commanded you at that time all the things which ye should do. Many people overlook this. The eschatological implications will show up in Deuteronomy chapter 28. Of course, it took faith for Israel to conquer the land, but it will take even more faith for the leaders to administer justice in the land. They will encounter continual opposition. The heroics of one day are easy, but constant day-by-day diligence and enduring year-by-year faithfulness are the heroics of a totally different and vastly more critical nature. That’s what Moses wants to deal with here. Before they got to Kadesh Barnea, they had to travel through more than 100 miles of brutal desert wilderness. This waterless wilderness would create hunger in their hearts and would give them a motivation to get to the Promised Land. Taking them through that route gave God an opportunity to demonstrate His fatherly provision, to show them His ability to care and provide for them — which He did in many ways. This was vital, remember, because they had come out of Egyptian paganism. They needed to learn to put all their dependence on the God of their fathers. They would be absolutely useless in the Promised Land if they didn’t learn that lesson. The combination of these — the hunger for the land and the confidence in God’ power — were necessary if the Israelites were going to accomplish the goal God had for them. Moses continually admonished the people not to be afraid. This gives us some feeling for the enormity of the task before them. The task was big, therefore the preparation had to also be big. Yet, after all that, the Israelites were fearful, and that generation did not get to enter the Land. They were forced to wander in the desert 40 more years, until a generation of Israelites arose willing to trust the LORD. Only Joshua and Caleb trusted God, and out of all that older generation, they were the only ones preserved to inherit the Promised Land. And I said unto you, Ye are come unto the mountain of the Amorites, which the LORD our God doth give unto us. Behold, the LORD thy God hath set the land before thee: go up and possess it, as the LORD God of thy fathers hath said unto thee; fear not, neither be discouraged. And ye came near unto me every one of you, and said, We will send men before us, and they shall search us out the land, and bring us word again by what way we must go up, and into what cities we shall come. Notice that it was the people’s idea to send in spies. It wasn’t an act of unbelief, necessarily; it can be seen as a move of good stewardship. 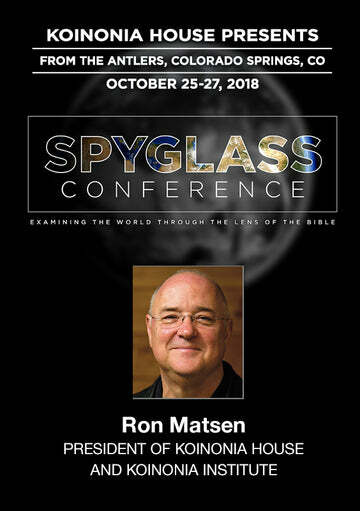 God didn’t require the spies, but He also doesn’t reject their plan. Israel therefore sent out 12 men, one from each tribe. When the spies returned, two of them, Joshua and Caleb, gave a good report. They brought back a bunch of grapes that was so large they had to carry it on a staff between their shoulders. These are called the grapes of Eshcol, and we even see a symbol of Joshua and Caleb bearing this huge bunch of grapes as the logo of the Israeli Ministry of Tourism. That picture of Joshua and Caleb has become an idiom for bounty in the Promised Land. The other ten spies, however are shaken up because they also find giants in the land. That’s the way it’s translated in our Bibles. The Hebrew word used in Numbers 13:33 is Nephilim — “fallen ones” — the same word used of the angel-human hybrids in Genesis 6. They did happen to be large in size, but that isn’t the frightening part. These “giants” were only partly human. To understand what Noah’s Flood was all about, we have to recognize that these strange hybrids had become prevalent on the earth in the years after Adam. They grew to be so numerous that God had to wipe out all mankind to eliminate the corruption. Noah and his family were saved on the ark because Noah was righteous, but also because he was “perfect in his generations” according to Genesis 6:9. Of course, it didn’t end there. Genesis 6:4 tells us that “and also after that” these things happened. The Nephilim are “fallen ones” because their fathers were fallen angels. It was Satan’s attempt to contaminate the bloodlines of the human race to prevent the emergence of the Messiah. The Nephilim were very large, and despite Joshua and Caleb’s encouragements, the other ten spies are terrified. They refuse to trust in God’s power, and they discourage the Israelites. In other words, ten of the twelve gave such a negative outlook of their prospects, the Israelites didn’t have the guts to take God at His Word. When you and I read the story, we say, “My goodness. What’s wrong with these people?” They had watched God send plagues on the Egyptians and then split the Red Sea to allow their escape. They had eaten manna provided to them supernaturally. They had drunk water produced from a rock. Why would they lose faith? It’s easy for us to judge the Israelites while we’re on the sidelines. God will find a new way, every day, to also ask us “do you trust me?” We are no different than the Israelites. We are constantly faced with the decision to fear the wind and waves of our lives, to fear the giants in our way, or to trust in God’s power and deliverance. The problem that the Israelites had was that they didn’t trust God, and we often have the same problem. As we start to look at these people, let’s be careful that the shoe doesn’t fit us. And ye murmured in your tents, and said, Because the LORD hated us, he hath brought us forth out of the land of Egypt, to deliver us into the hand of the Amorites, to destroy us. Whither shall we go up? our brethren have discouraged our heart, saying, The people is greater and taller than we; the cities are great and walled up to heaven; and moreover we have seen the sons of the Anakims there. We’re told in Deuteronomy 3:11 that the bed of Og king of Bashan was 13 feet long. The Anakim, the sons of Anak, were Nephilim, although after the Flood they were typically called Rephaim. There were several tribal names of groups that all appeared to be Nephilim in different areas. We see them mentioned in a variety of places, like Genesis 14:5 and Deuteronomy 2:11 & 20. They include the Rephaim (which means “the dead ones”), the Emim, Horim and Zamzummim. Anak and his seven sons were called Anakim. They’re encountered repeatedly in Numbers, Deuteronomy and Joshua. Satan attempted to corrupt Adam’s line in Genesis 6, but God sent the flood and saved Noah’s family. As God revealed His plans through Abraham, Abraham was singled out by Satan in Genesis 12 and 20 to lose Sarah. However, God intervened, and Isaac was born through Sarah. A famine hit the earth in Genesis, threatening to starve Abraham’s descendants, but God sent Joseph to Egypt to provide for them. Pharaoh attempted to destroy all Hebrew males in Exodus 1, but the midwives refused to murder the babies. Even after he let them go, Pharaoh pursued the Israelites, but his armies were destroyed in the Red Sea in Exodus 14. When God told Abraham that his descendants would come back to the land of Canaan after four centuries, Satan had four centuries to lay down a mine field. The Rephaim are that minefield. That’s why God instructed Joshua to wipe out every man woman and child in Canaan. In 2 Kings 11:1–2, queen Athaliah tried to kill all the king’s sons, but Joash was rescued by his father’s sister. In 2 Chronicles 21:16–17, the Philistines and Arabians carried off all the king’s sons but the youngest, Ahaziah (Jehoahaz). During the Persian Empire, Haman tried to wipe out all the Jews. God gave Esther favor as the king’s wife, and she succeeded in intervening for her people. In the Matthew 2:13–18, Herod killed the babes in Bethlehem, but God warned Joseph to flee to Egypt. In Luke 4:28–30, the people of Nazareth tried to throw Jesus off a cliff, but He walked safely back through them. A supernatural storm threatened while Christ was on the sea in Mark 4 and Luke 8, but Jesus took authority over the storms. Finally, Jesus was killed on the cross, but in doing so He fulfilled all righteousness, saving the world and conquering sin and death once for all. Satan is not through. He tries to devour the Messiah in Revelation 12, but he fails. He will certainly attempt to destroy the woman — to destroy the children of Abraham and so prevent the return of the Messiah. Of course, he will fail then too. As we look at Deuteronomy, let me give you something to think about. What do the Golan Heights, Hebron and the Gaza Strip have in common? These were the areas in which Joshua and the Israelites failed to exterminate the Rephaim. While the people of Israel did take the Holy Land under Joshua, there were places in Joshua and Judges in which they did not completely eradicate the Canaanites. 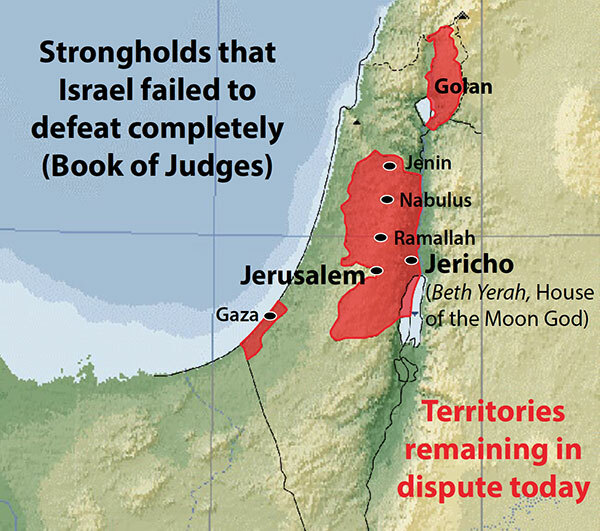 Strongholds of the enemy remained in the land, and if we look at a map of Israel, we see that those are the areas still in dispute today. Jenin, Nabulus, Ramallah, Jericho, Jerusalem and Gaza are all places where Canaanite holdouts remained. This is not merely a physical issue, whether or not the descendants of those ancient Canaanites still exist. There is something supernatural going on here. These are areas that were not cleansed physically and spiritually. The real war is not between Hamas and the Knesset. The real war in Israel is a spiritual war. Then I said unto you, Dread not, neither be afraid of them. The LORD your God which goeth before you, he shall fight for you, according to all that he did for you in Egypt before your eyes; And in the wilderness, where thou hast seen how that the LORD thy God bare thee, as a man doth bear his son, in all the way that ye went, until ye came into this place. God is a tender, loving Father. He has provided for His people. As Moses speaks to the children of Abraham, the people simply need to remember their own recent past to be confident in their future. By simply looking back at their own lives, they can see how God has protected them and sustained them. They didn’t need to be afraid, because the Lord intended to fight for them! Their parents were perpetually convinced that God brought them into the desert to destroy them. They sat in their tents, murmuring and wringing their hands about it, as though God couldn’t hear them. God hears us! Yet, God had always intended to fulfill His promises to Abraham, Isaac and Jacob through them. The whole issue here in Deuteronomy is “Do you trust the Lord or not?” That’s the thrust of Moses, reminding his people of what God has done for them so far. That’s very interesting. Notice this. The people had murmured and said that, “God brought us out here to kill us.” In the end, God agrees with them, saying, “Well, that wasn’t what I had in mind, but that’s the way it’s going to be.” He didn’t forsake Israel, but He let that particular evil generation die in the desert. He waited until they had perished, and then He brought their faith-filled children into the Promised Land. They said, “He brought us out here to kill our children,” but they got it backwards. Their children are now listening to Moses, anticipating the fulfillment of God’s promises in them. The unbelievers didn’t just die naturally. There were plagues and earthquakes and snake bites and slaughter as a direct result of their repeated wickedness. The word fathers or forefathers occurs 21 times in Deuteronomy, and this terminology is used to stress Israel’s relationship to the covenant promises. That’s why the link is so important; this is their connection to the commitments of God. While God swore to exclude every warrior of the rebellious generation from the Promised Land, Caleb and Joshua and the younger generation were able to inherit the blessings of God’s promises to their fathers. Are we wholly following the Lord? Do we trust God with all our hearts? Do we view the giants in our lives as mere dust piles because we are focused on God’s love and faithfulness? Are we confident that He is able to conquer every enemy that rises up? Caleb and Joshua were, and God blessed them for it. We all feel fear at times. That’s not the issue. The issue is, what do we choose to do with that fear? Do we hide in our tents, murmuring doubt and unbelief, or do we shove our fear behind us and purposely fix our eyes on the God and His faithfulness? Also the LORD was angry with me for your sakes, saying, Thou also shalt not go in thither. But Joshua the son of Nun, which standeth before thee, he shall go in thither: encourage him: for he shall cause Israel to inherit it. It shocks us to realize that God’s judgment was extended even to Moses! Moses reminds them that God was upset at him for his own bad behavior. That’s why he says “the Lord was angry with me for your sakes.” Moses is not blaming the people, but the people did create a situation which moved Moses to blow it. God told Moses to speak to the rock to provide them water at Meribah in Numbers 20:7–13, and instead Moses struck the rock. God took that act of disobedience so seriously, He prohibited Moses from entering the Promised Land. After leading that griping, complaining people for 40 years in the desert, Moses himself didn’t get to enter into the land. He was allowed to see it from a hilltop, but he was denied entrance. He was taken out of the ballgame right at the main event because he blew it. Of course, even with the knowledge that he will die in the desert, Moses doesn’t just lie down. His primary job is now to encourage and strengthen Joshua and the Israelites for the task ahead. Moreover your little ones, which ye said should be a prey, and your children, which in that day had no knowledge between good and evil, they shall go in thither, and unto them will I give it, and they shall possess it. But as for you, turn you, and take your journey into the wilderness by the way of the Red sea. Moses is still reminding the Israelites of their past, and this verse is full of interesting insights. The children were not held responsible for the cowardice of their parents. They were assured possession of the land while the parents were sent back to the desert. The author of Hebrews later points to the wilderness strewn with the corpses of that faithless generation as a grim reminder. There are consequences for lacking confidence in God’s power. God provided for the Israelites. He did huge miracles on their behalf. He wanted to bring them into the Land, but He had to let the faithless parents die in the desert. He could not pollute the land with unbelievers right from the beginning. When we fail to appreciate the power and love of God, we’re poking a finger in His eye. That’s disturbing stuff. We get enamored with grace, but we fail to realize some of these implications. God loves us completely, and He has tremendous patience with us. That’s why it is such an incredible insult to suggest He doesn’t love us. He gave us everything. He gave us His Son. All eternity is ours because of God’s self-sacrifice. How can we be so cruel and foolish to think for a moment He doesn’t love us or that He can’t be trusted? Trusting God is loving God. If we trust Him, though, that also means we trust Him enough to obey Him. Real trust says, “I know Your way is best.” Deuteronomy will really make us conscious of our responsibility for obedience. Of course, the disobedience of the parents continually got them in trouble until the end. Then ye answered and said unto me, We have sinned against the LORD, we will go up and fight, according to all that the LORD our God commanded us. And when ye had girded on every man his weapons of war, ye were ready to go up into the hill. And the LORD said unto me, Say unto them, Go not up, neither fight; for I am not among you; lest ye be smitten before your enemies. God told them to take the land, and they were afraid, so He said, “Forget it.” Then, they decided they’d go up and fight after all. God said, “Don’t!” but they tried anyway. They weren’t good at following directions, and they got decimated. Even when they got ready and went out to fight, they were still in rebellion. Rebellion just never ends well. So I spake unto you; and ye would not hear, but rebelled against the commandment of the LORD, and went presumptuously up into the hill. And the Amorites, which dwelt in that mountain, came out against you, and chased you, as bees do, and destroyed you in Seir, even unto Hormah. They were in Negev, the southern portion of Canaan. Negev means south, and it speaks of the desert area to the south. “Seir” is an early name for Edom. And ye returned and wept before the LORD; but the LORD would not hearken to your voice, nor give ear unto you. So ye abode in Kadesh many days, according unto the days that ye abode there. So they blew it! They wouldn’t go when God was with them, and then when He wasn’t with them, they were foolish enough to go, and they got clobbered. The Bible is an incredibly consistent book. Trust and obedience are always the keys to blessing. We might have times when we suffer because of the decisions of others. We might have to be patient and wait on God’s timing. We might have hard times in the desert while God takes us where we need to go. However, in the end, patient trust and obedience in God’s love for us will bring us to a place of great blessing. Wherever you are in your walk, don’t be discouraged. God really does love you, and He will be faithful to fulfill His promises to you too. We are no different than the Israelites. We can fall in all the same ways that they fell, but we can also have victories in the incredible ways that God gave them victories. Jesus quoted Deuteronomy often for a reason. As we read through Deuteronomy, we are not merely reading the final sermon of Moses, we are reading the heart of God. Let us keep our own hearts soft toward our Heavenly Father, that we might be like those who entered the Promised Land. Part 3 will appear in the October 2017 issue of the Personal Update.